Posted by aquillam in Astronomy, teaching. Warning: long post! CTools is the Sakai based LMS we use at Michigan. If you don’t understand that sentence, this won’t be useful. You should go outside and play instead. Jeff Zeigler presented some tips, tricks, and tools in CTools. Some of these were underused or unusual implementations of old tools, some were new features. I have rearranged things slightly, and added screen shots from a couple of my own sites to illustrate these. Also, note that Friend accounts pose a challenge. If they are already on a CTools site, they can join your site using the email link. If they haven’t been added to any CTools site, you will have to add them manually, regardless of whether or not they already have a friend account. 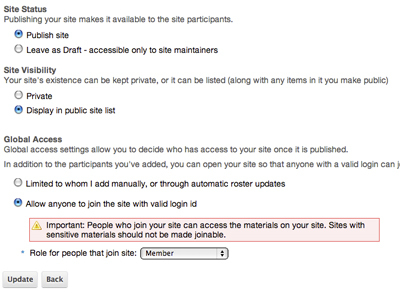 Click the Joinable Sites button to search for sites you can join. You can find publicly visible joinable sites by going to Membership in My Workspace and clicking the Joinable Sites button. Jeff sent an email with a link so we can add ourselves to the site by clicking a link. This would work particularly well if you are looking to expand services for an MCommunity (online directory) group. Joining using the link worked fine for most of the people in the class, but others had some trouble. No one who was already logged in to CTools had trouble, so you may want to include instructions telling people to go to CTools.umich.edu and log in, THEN come back to the email and follow the link. Remember, although both CTools and the mail system use CoSign for authentication, CTools makes you re-log after about half an hour of inactivity, so the user could be logged in to email, but not to CTools. MCommunity sometimes needs a couple hours to sync across all services (especially at the start of term), so give it some time if you make a bunch of updates. paste that url into an email. The Site Information Display is displayed on the homepage of every site. It can take text input, or it can take a url. 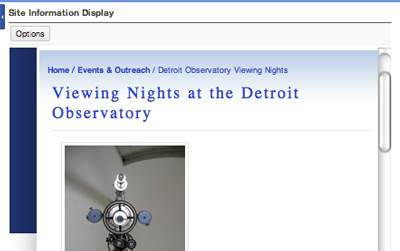 Note it won’t show both, but you can create a webpage in Resources and point to that. Jeff added the URL to the root folder in Resources, which displays an easily navigable but read only version of resources tool. Placing a link to the Resources under the Site Information Display. 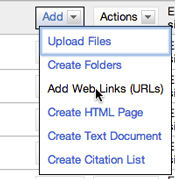 Select Edit Details under Actions to get the page URL. In Resources there is a url for each item. 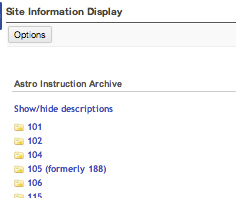 Click the Actions button for the folder you are interested in and select Edit Details. Next to Web address (URL) click Select URL (for copying), then copy the URL. Go to Home page and click Options under Site Information Display. Scroll down to where it says Site Info URL and paste URL into the box. The reset and expand all buttons. The reset button next to the tool title takes you back to the default view for the tool (handy if you are lost deep in a tool, like the test center or Resources). It is available in all the tools. There is an expand all or collapse all arrow in Resources. It toggles, starting from expand all. Use the expand all button, then the browser find command (command+F on Mac),to search for a word, date, owner, etc. Note this is not the same as search, so you’ll have to mach the words, including the order and spacing, exactly. If you are a site manager, you will see a Check Quota button at the top of Resources. 3 GB is default quota, and is plenty for most sites. ITS can grant more space if there is a good reason, so if you really need more, contact 4Help. CTools isn’t really designed for streaming video, so saving video in Resources isn’t recomended. It is better to embed the videos. Whatever WedDAV method you use, you need the uri from the upload/download page. Other thing are possible (like renaming things), but only upload and download are actually supported, so doing other things isn’t recommended. Note if you rename folders, the name will not change in WebDav because the new name in CTools is a display name, not the actual folder name. 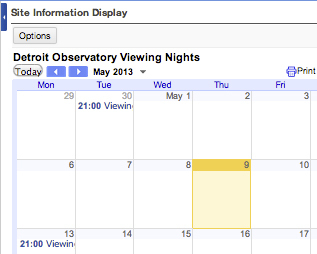 Find or create the calendar you want to display and open the settings. Once you think it will be visible to the right people, go back to the Calendar Details section and scroll down to the Calendar Address: section. Click the HTML button, then copy the URL that pops up. Go back to your CTools site, to the Site Information section. Check the box next to Web Content and click Continue. This opens a new window where you can enter a display name for your calendar and the URL that you copied a minute ago. Click continue, and a new item should appear along the left for your calendar. The Google Calendar now appears as one of the items on the left. You could also use the embed code from Google to create a webpage in Resources, or paste the URL into the site info to display the calendar on the home page. Currently available in stealth mode only but it MAY be ready for general use by fall. Essentially an appointment scheduling tool. Some users find it VERY useful, especially for things like office hours. like iClicker anonymous polling, it records whether or not someone responds, but their actual response in not associated with their name. Embedding the video means its still on youtube’s site (not taking up your quota, or forcing students to download video to their local machine), but students don’t have to leave CTools, watch adds, or get all the (sometimes inappropriate) related content. Find the video you want, and click the Share button. Go back to your CTools site, to the Resources section. Paste the URL into the box for the address, and give it a nice display name. Click Add Web Links Now to save. If you want, you can add this to the home screen, or add it to the list on the left. Go to Actions -> Edit details and copy the URL for the video in CTools. Then you can add it using one of the methods outlined above for adding a URL to the Site Information Display on the Home screen or adding Web Content under Site information. The University is just a few short years from the start of its third century, and we face some of the biggest challenges ever to higher education. The traditional model of researchers who act as sage-on-the-stage teachers is not going to cut it moving forward. The 3rd century initiatives from the Provost’s office are meant to spark the innovation and changes needed to help Michigan remain the Leaders and Best into our third century and beyond. Learn more at the Third Century website, http://www.provost.umich.edu/thirdcentury/. As with the keynote, I’ve summarized what the panelists said rather than reporting it in chronological order. Also, as I type names over and over, I start typing them wrong and forgetting to capitalize. My apologies if I get a name wrong, and I hope no one is offended by my use of first names. Melanie: we want to ensure students have “experiential experiences”, modern programming to keep ahead of our competitors. We want Michigan to be one of the best schools out there. Tim: Learning Analytics (LA) is made possible by data generated by large classes and tools like CTools. The students work, habits, and activities are recorded and preserved in a way that never used to be possible. This gives us the opportunity to explore things like what habits lead to success, AND if you really need to take class A before class B. LA can lead to greater personalization of the student experience. Becky: We usually think of teaching & research as the two things we do, but the Global Challenges program asks faculty to address real world problems, collaboratively, with their students. Mark: When talking to researchers, they found that there were a lot of ideas out there, but many people had trouble finding funding and appropriate collaborators. collaborators (hence the cube), including at least one person from another department or school. Laura: The past decentralized technology structure will not support the action based teaching, international team based research and big data analytics that these programs need. We need new IT services – NextGen Michigan. Mark: MCubed wanted to change the dialogue from “what does [insert funding agency name here] want to fund?” to “What issues can we tackle or solve?” The large number of cross-school collaborative projects that have already started make him think that is happening, and in an economical way. Melanie seconds what Tim said about it being early days. Her group is working on a website to help disseminate the information. Becky’s group is also working on a new website. Since many of these initiatives involve taking risks, how do these affect the tenure process? Becky (speaking as a chair): Young faculty interested in these programs should pursue them in parallel to their other, more traditional work. Mark seconds that (wearing his chair hat.) Tim points out that the learning initiatives are aimed at changing things, so its rare for young/new faculty to have enough experience to have something they need support changing. The ones that have the experience and enthusiasm from the start usually have no problem with tenure. Can LA translate to research analytics? Tim – interactions and collaboration in things like Google and CTools leave a research trail now, so RA should be possible. eg there is a project analyzing how office placement affects the probabilty of research collaboration. In the future, we need to have better metrics than the number of citations to determine research success. Do these initiatives allow for the assessment of higher learning (content mastery vs. content recollection)? Tim – the work itself is now retained (unlike in the past when a paper was given back to the student and was gone from their academic record), so researchers have now have access to the record of what students did. Also, with tools like Google Docs, researchers can see who edited the document, when, how much, etc. Provides fantastic opportunity for researchers, even if we dont know what to do with all that data yet. Melanie – One of their grants is for how to use writing in the sciences. Ideally, the results should show if learning is enhanced by writing instead of the normal multiple choice type questions. Do any of these programs specifically address disabled students? Melanie – not specifically part of their charge, but projects that enhanced learning or targeted different learners would fit the grant criteria. Tim – LA should make education MORE personal, so there could be different tools used in one class. Mark – very visual learner, so ideas for visual learners into their plans, even though not specifically part of goals. Laura- did not plan on visualization tools this year, but expect it soon. It will be a high priority for Google too, especially general accessabiliy. She believes it is a goal of Google to have a very similar experience for users of all different abilities, so blind or deaf users won’t need a different set of tools. How will these initiatives break down silos? Laura – deans have been talking about experiential and action based leaning and changing the classroom experience. North campus has been talking about freshman cross-discipenary class where students from different schools have to collaborate and present an end of term project together. When you interview people at the university, you find lots of expertise, and everyone is busy. There is a great deal of value added if you can collaborate. Mark – MCubed’s goal is to break down silos. On the curriculum level, we want students to reach across units, but only to a limit – employers need to know how they were trained. In research it doesn’t matter so much, and the collaboration makes new things possible. Melanie – one of the goals is to adress this. Especially, they want to determine the best ways to teach: maybe cross disciplinary is the way to go. Silos lead to redundancy. We need to break that down and put students doing the same things together, even if they are in different schools. Tim – want to move the expertise and collaboration to student level. Make them a valuable team player even if they aren’t in their usual place. A physics student in an art class may find a unique way to balance a sculpture. How will staff and students be involved? tim – many students are on the LA teams already, usually as the ones doing the number crunching. However they didn’t really think about this in the first round. One way to be different is to have the students doing more. Staff expertise is important, but including them is hard because they already have ful time jobs. Working on these projects would be on their own time for most. Mark MCubed money must go to students or post docs, although 15% may be allocated to staff (but again, paying staff is a problem because they already have jobs). There are so many students that it is difficult to give them tokens directly. Melanie – student orgs are doing amazing thing on pennies. Including them or exploring how they function is a good way to go. How to encompass all different students (undergrad, grad and post-doc), and collaborate at all levels? Tim: personalization – LA would be able to help direct the message to the student who wants that info (like a umich news aggregator for your phone). He suggests empowering students to design something for that, since they know better what they need and would probably do a better job. Couldn’t tailoring messages be the antithesis of collaboration and creativity? Tim – Students already have something to recommend classes, instructors, etc – their roommate. We can improve this. Students need to be able to put in what they want, or dont want to see, but then the data from LA can fill in the holes, tell them about things their roommate doesn’t know about. How do these projects scale? laura – the issue of scale is interenting. the interest of most people is not how do we get 100k people in a course, it’s how do we change how people interact to make a class of 60 as good as a class of 10. Michigan must always be a place where students want to come to do a residential program. Its a matter of effectiveness and efficiency, not scale. Students come here for the bredth of program and quality of faculty. What is action based learning? Tim – anything that moves the focus to doing instead of receiving information. He also said students need to be empowered to make decisions about their own learning. For example, gamify a course so students accumulate points instead of loosing them. Provide the opportunities within the class context, don’t expect it to burble up from below. In a sense, inquiry based learning is less efficient because students are exposed to less content. How do we balance the deeper learning with the necessary breadth? Tim – right now, we teach a certain amount of material in the introductory phyics classes because the instructors of the higher level classes say the students need this information. But when the students get to the higher level class, instructors find they dont actually retain what they learned! LA should help us figure out how much to teach deeply, and how much to brush over so they’ve at least seen it once. We need the ability to prove that that inquiry based learning leads to deeper/better learning, and that that deeper learning is more important than exposure. In 2 – 3 years as current programs wrap up, what are the hallmarks of success? Mark – that MCubed would be a permanent program, that enables more creative work, and leads to Michigan being seen as premiere university for innovation. Becky – success would be if the NYT or Atlantic notices these global initiatives and has articles about them. Tim – that anyone who is on campus can get an answer backed up by real data (open tools with portals for faculty and students). That students can base decisions on classes on something better than Rate My Professor. Laura – problems today need to be solved by teams, not individual. NextGen gives UM a competative advantage to colaborate quickly and efficiently. Ann Arbor is also invested in innovation. Can we engage with those local innovation communities? Laura – the fact that the community is more aware of us than we are of them is a powerful statement. We need to do more to enhance those community connections. Becky – when developinng criteria for which ideas to fund, we wanted to solve complex problems. But, all else being equal, something that engages the local community and created connections was important. Tim – The LSA instructional team created Blue Core – people who just graduated and were willing to stay here in A2 for a year to help faculty with teaching technology. There were more posters than I was able to really get to (and the room was rather crowded, and me with my backpack). So this is sure to be missing a lot. I provide titles and authors/collaborators even if I didn’t get anything else. The numbers refer to the poster number. Mika offers students several paths to success. rather than deducting points for getting things wrong, students gain points for doing things right. They have the option to stop work when they are satisfied with their grade, but few do. Students become responsible for their own learning. This causes some push-back, especially from the over-achievers who want to know exactly what they have to do to get an A. For some, it becomes about getting the points, not about learning, so you have to be careful about your assessments. Documenting better learning is hard. Used an app called gradecraft. See Tiny.cc/polsci101_f11 and Tiny.cc/polsci101_f11 for details about the courses. An iBook, which includes the music, videos of people playing the music, links to things like the history of the piece, and anything else that might be useful to a student studying the piece. Looks like a lot of fun even without the class. Gillespie created a device he called a cigar box to demonstrate principles in class. These reminded me strongly of the black box “hypotthesis machine” we used to have in physics. In this case, students would make predictions then change a set of switches to see if their predictions worked. didn’t get to try one though. Alvarez wanted to enforce the idea to his students that their work has a lasting impact. He had his students find a stick and carry it with them for an extended period (4 weeks I think). They were required to keep journals for their sticks. Many of them decorated their sticks, and even developed backgrounds and stories to help them cope with the awkwardness of carrying the stick. Students became more invested in the class when they thought they were doing real good. This was an experiential course,and I really would have liked to ask more questions about how the course itself was run. This couse used videos pre-class to engage and excite students about a topic. Students then worked on collaborative reading assignments using nb http://nb.mit.edu/welcome. Homeworks were hard. Students were expected to work on assignments before class, but not finish them. They try to actually come up with the solutions collaboratively during class. two classes were run simultaneously, one with traditional lecture. The students in the no-lecture course did better on assessments. Traditionally, during in-class collaborative work, you’ll find one student dominating the conversation. Often, female, minority, and ESL students are shut out of these conversations. Using an online forum (Google drawing with the chat turned on) helped mitigate this. Fowler say a statistically significant increase in participation especially from the ESL students. Additionally, there was greater sharing of ideas, as multiple people were willing to share similar ideas. Flipping the classroom significantly improved student attitudes and participation in the class. Actually, the title of the keynote was “What Have We Learned From MOOCs? A Panel Discussion of the Implications of Massive Open Online Courses for Teaching and Learning ” but that seemed too long to include as blog post title. First, a bit of a disclaimer. I am a slow typist. I may have missed things and miscopied them. The videtape of the session will be posted at http://ttc.iss.lsa.umich.edu/ttc/ latter this week. It is much more authoritative than me. Guatam Kaul taught Introduction to Finance (the twitterverse offers this story about Kaul’s course and philosophy: http://www.businessweek.com/articles/2013-03-28/mba-q-and-a-michigans-gautam-kaul-on-his-atypical-mooc ). Eric Rabkin taught Fantasy and Science Fiction: The Human Mind, Our Modern World. Caren Stalburg taught Instructional Methods in Health Professions Education. It was moderated by Barry Fishman. Hopefully, no one will mind if I take the liberty of referring to them by their first name from here on. Also hopefully I’ll spell their names right.you wouldn’t think that would be hard, but my computer really wants to “correct” Gautam and Caren. Guatam started out with a simple definition: “Technology is anything that make teaching effective.” Technology is any tool, whether its a smartphone app, the internet, or a stick (see my post on the poster fair, once I get it ready.) Within this context, MOOCs are a tool we an use to improve visibility, and to allow access to those who otherwise wouldn’t have access. Additionally, MOOCs provide VERY BIG NUMBERS, which has significant impact on our ability to gather data on Learning Analytics. This has potentially huge implications, since small sample size has been one of the greatest hindrances to good data for learning analytics. Barry points out that MOOCs are really nothing new. In Colonial America, you could sign up for correspondance courses in shorthand.It the 20s and 30s, there were classes taught via the radio (he didn’t mention it, but by that time there were classes being taught in rural areas via HAM radio, so kids who lived 20 miles from their nearest neighbors still got a basic education, a practice that persists even today in some areas.) Latter those radio courses became TV based (Bob Ross anyone?) The Open University in the UK teaches hundreds of thousands of students every year, most of whom are non-traditional students. So what does this new technology and emphasis mean, and how does it change things? While UM has focused on the Coursera platform, that’s not the only option. See the Chronicle of Higher Ed for an interesting and brief overview of the major players http://chronicle.com/article/Major-Players-in-the-MOOC/138817/. Technology enables, frames and constrains our teaching, but learning should never be about the technology. You can do good things with bad technology, and bad things with good technology. It is rare for technology to sweep into education. When it does (like CTools), it does so because it doesn’t challenge what we’ve been doing effectively. Once the panel discussion really started, a few ideas repeated themselves, so rather than trying to replicate the dicussion, I’m going to try and organize this around the themes. All three panelists said the MOOC took more work and more time than a residential course. Caren said one of the biggest challenges was figuring out what material could be used, because so much of what she would normally use (like images from the text book) is copyright protected. In addition to taping lectures, she also has to find or create all the support materials. MOOCs need to be truly open. Gautam spent a lot more time developing questions. Also, spent more time trying to figure out how to make it be more than just a talking head. He could not answer emails individually, and in fact would not answer most of the email from the MOOC students. Eric said that teaching a MOOC was far more work than developing an entirely new class. He also said he thought it was ok it you have 100k students register and only 5k actually finish. Teaching MOOCs makes them better teachers in general. Caren: MOOCs require more efficiency in how people use their time in class and preparing for class. The materials and strategies developed for the MOOCs transfer to the residential classroom. The real power is that MOOCs let you disseminate information to a wide audience. Gautam: The tension encountered when translating a residential class to a MOOC makes you a better teacher. Knowing you are being watched by thousands, and that are representing your institution to them, makes you want to do your very best. MOOCs require more careful thought about what questions you ask, so it forces you to think more about what questions really count. He also found that students are more likly to be open and honest in a really large, fairly anonymous online chat than they would be in face-to-face conversation. MOOcs also offer more interdisciplinary opportunities because of the wide audience they attract. Eric found due to the size ef the class, students needed to be MORE accountable for pre-class work. Each week he assigns an essay on the reading. The essay is due early, and the results are randomly and anonymously handed out to other students. The other students hand the essay back, with feedback, so the author can see their thoughts just before class. Everyone has not only prepared their own thoughts, but has been exposed to other thoughts as well before having the discussion. Ideas that MOOCs are cool and new came up several times, and it really seemed that being able to disseminate the class to such a wide audience help them refrsh their love of teaching, and their desire to be good teachers. This is a complicated question on many levels. The person primarily hurt by the cheating in a MOOC will be the cheater, who doesn’t fully engage in the class. The question then arrises as to how much responsibility the instructor really has to prevent and punish plagiarism? How do you punish someone who isn’t paying and isn’t getting credit? What really constitutes plagiarism? In a class of thousands, two people can have the same idea at about the same time. Is it plagiarism if someone didn’t bother to read a forum discussion before posting their thoughts? What if two people collaborate on something, and the ideas are joint ideas? What if they don’t credit their collaborators – is this a forum where the dissemination of ideas is more important, or where practicing professionalism and giving proper credit is more important? Eric had a complaint from a student that another student had nearly copied a section of his essay from a book without citation. It turned out that he was the book’s author. Is it plagiarism if you don’t cite our own work? Eric offered a solution, which is to make cheating uneconomical. For example, rather than assigning a single paper, assign a statement on the subject (i.e. a thesis), an outline, an abstract, a rough draft, revision, and the final paper. Someone may still buy a paper, but they’ll have to do a lot of work deconstructing it to complete all the assignments. Guatam: Degree granting should never be the goal of MOOCs. However, their existance is important. It forces the university to consider what it’s role is, and what is the value of a degree from UM. In their current form, MOOCs should NOT be used for giving credit. Caren: competency should be the measure of success, not hours in the classroom. Eric: residential programs count for only 25% of degrees. MOOCs pose a challenge to tradition ed, but it is a challenge we already need to face. This needs to happen if faculty are to invest their time in MOOCs in a meaningful way (ie as part of thei regular jobs). Eric: if you have 50 thousand people register, a course fee of $5 would cover costs. Also, need to consider who should be covering the costs. Maybe instead of the students it should be the companies and organizations who want to employ the trained students. Caren: Could charge for the assessments – the opportunity to learn is free but the assessment costs money. From Eric – teach a MOOC because it is new and exciting, helps the world, disseminates information to a wide audience, or is interesting to you, not because it pays well or looks easy (it doesn’t, and it isn’t). He described things like the Kahn academy or TED talks as a buffet: if you want, you can go grab dessert and leave. A MOOC needs to have units that build on each other. To expand the analogy, a MOOC is like a meal in courses. You can always go back to the previous course for seconds, but there is still a progression. You have to sit through the vegetable course before getting dessert. Caren – the materials need to be engaging, but not flashy. You need to find a way to create a sense of community so the students will invest in the class. Materials must go beyond the video. Links and cross connections enable students to make connections, go back and build on what they’ve already done, or explore further. MOOCs have the potential for a huge impact. That should count for something, especially for tenure-tract and non-tenured faculty. Guatam: Who cares if the students don’t finish the class. What really constitutes a class in this sense? In working on developement, it important not to invest too much time making something new and amazing – it is MUCH more than the videos. Also, never forget the residential students. They are the ones paying for the class and they need to be the ones who really benefit.